The black gelding that Kitto had 'borrowed' from the castle stables was really far too big for him, and skittish from lack of exercise into the bargain. But Kitto was sure he could handle the animal. Besides, it had the two qualities he wanted: it was built for stamina rather than speed, and it didn't belong to anyone in particular and so would not be missed for some time. By evening he was deep among the mountains and a satisfactorily long way from the castle. He had given the horse a rest earlier and it was still fairly fresh; rather than stop just because the sun was setting, he thought, he'd keep going until the animal grew tired, then make camp for the night. He had a bag of oats, food and a blanket for himself, and there were plenty of springs to provide water. All in all, he was doing very well. The sun's last rays were shining rose and crimson on the tops of the peaks, but the gorge through which he rode was heavy with shadows. They played tricks with the eye, looking more tangible than they really were; a sharp edge of darkness slanted across the next bend in the track, and as he approached it Kitto could easily have believed that he was heading towards a solid black wall. Suddenly the horse jinked. Its head jerked up and it flattened its ears, snorting as it slithered to a halt. Kitto said a word that wasn't permitted in the castle and kicked its flanks, telling it to 'Get on!' But the animal only shied again, stamping. Then it whinnied shrilly—there was something unnerving about the way the sound echoed between the gorge walls—and Kitto's arms were jerked nearly out of their sockets as it snatched at the reins, trying to pull its head free. 'What's the matter with you, you stupid beast?' Kitto yelled. 'Come on! Forward!' He kicked again, harder, and the horse danced sideways, stiff-legged, jolting him violently. The shadow moved, and Kitto almost fell out of the saddle in shock. 'What in the names of…' He heard his own voice, heard it tail off and echo slowly, eerily away through the pass. It faded into silence, and with a peculiar, unreal feeling in the pit of his stomach Kitto found himself sitting rigid on the horse's back, staring along the track and unable to move a muscle. The horse was motionless, too, frozen, as though something had pinned its hoofs to the ground. It was trembling. And the shadow had doubled in size. No, Kitto told himself ferociously. I'm imagining things. It hasn't changed. It can't have done. With no warning the horse uttered a shriek of blind panic and reared, forelegs raking the air. Caught completely unawares Kitto was flung backwards; he made a wild grab for the saddle pommel, but his hand closed on nothing and he pitched from the gelding's back. He hit the ground with an impact that punched the breath out of him; rolling, he saw the blur of the horse's great, dark bulk above him, then a flailing hoof glanced stunningly across his skull, and he sprawled with his face in the dust as the animal slewed around and bolted. For some seconds Kitto couldn't move as pain surged like waves in his head. But instinct came to his rescue and with an effort he raised himself enough to lift his face from the dust and look with blurred vision along the track. Something white and fast-moving smeared across his vision, and a shattering roar dinned in his ears and resounded through the gorge. Kitto had time for a single scream—then the whiteness launched itself at him, and he crashed to the ground again under its onslaught as the entire world blanked out. He regained consciousness to find himself lying on dry, hard-packed earth, with a shaft of cold light shining on him. For a horrible moment he panicked again, thinking, I'm dead—the thing that attacked me carried me off, and this is its lair in the Seven Hell! But then reason came back. He couldn't be dead, for his head ached fiercely and he could feel bruises all the way down his spine. So where was he? Kitto's eyes widened as he remembered what he had glimpsed in the instant before he lost consciousness. He sat bolt upright in a flurry—and from the deep shadows at the back of the cave came a soft, rumbling growl. Something whuffed by his ear and Kitto was nearly sick with terror. But then a new sensation invaded his mind. A message; not words but a feeling, faintly amused, faintly pitying... and friendly. Hardly daring to believe it, Kitto found the courage to turn his head. It was the biggest mountain cat he had ever seen. Nose to tail-tip it must have been at least twice the length of a tall man, and its fur was silver-tipped white, shading to grey only on its muzzle and haunches. For a few seconds it gazed at him with calm interest. Then it stretched forward, sniffed his face, and licked his forehead. Kitto was stunned. He had always been terrified of these giant cats, despite the fact that they hardly ever attacked humans and in fact kept well out of humans' way. But now, face to face with one for the first time in his life, his fear vanished. The cat was a friend; he knew it as surely as he knew anything. In fact it had saved his life. Or was it? A sharp tingle went through Kitto as he realised that his rescuer couldn't possibly be any normal creature. Just as someone had sent the crawling dark shadow to devour him, so someone else must have sent the cat to protect him. But who? The answer was obvious and made him tingle again. 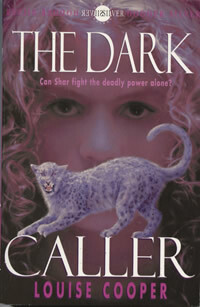 Cats had strong links with Chaos, and strong links with Shar. This was all beginning to make sense. The animal turned its head and looked at him, and a clear image flicked into Kitto's head. He saw Shar walking in a garden, with a small white cat at her heels. A pale aura shone around her as though protecting her; but in the background was another figure, a faceless human silhouette that lurked and followed, and from which Kitto sensed a wave of evil. The vision faded and Kitto shivered, but he thought he understood. Shar was safe, at least for now. The darkness was close behind her, though, and if its chance came, it would strike. Kitto felt suddenly angry and helpless. He wished Hestor was here, and for a moment thought of going back to the castle. But he couldn't risk alerting the Circle—and anyway, it would take too much time. He had to get to Wester Reach. He had to find Shar. In the distance among the peaks there was a rumble. At first Kitto though it was thunder, but then, listening, he heard something else; a thin, high-pitched wailing, as if a hurricane was rushing in from far, far away. Then a flicker of eerie, crimson light swept across the cave entrance, momentarily eclipsing the glow of the moons, and his pulse quickened. A Warp—one of the great supernatural storms from the realms of the gods! Was it an answer to his plea? A wall of wild green light flashed through the gorge outside; thunder sounded again and the wailing was growing louder. Kitto huddled back against the cave wall; he had always been frightened of Warps and couldn't break the habit even now. But the cat raised its head eagerly, and a snarl of excitement vibrated in its throat. Then, as the wailing rose to a demented shriek and the third thunderclap exploded almost overhead, it opened its mouth and uttered a shattering roar—a roar of challenge and resolve, that rang out in turbulent harmony with the din of the breaking storm.